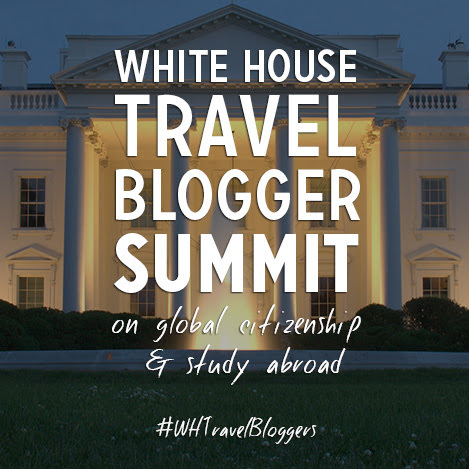 If you want to immerse yourself in the world of haute couture during Spring Break, Houston is the place to visit. After several weeks of drawing crowds of fashionistas from across Texas, “The Glamour and Romance of Oscar de la Renta” exhibition will close Sunday at the Museum of Fine Arts, Houston. 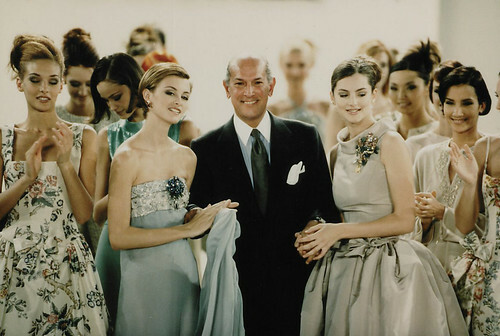 De la Renta earned international acclaim when he began dressing First Lady Jacqueline Kennedy. From there on out, he dressed every First Lady, culminating with Hilary Clinton. He also has dressed celebrities such as actress Penelope Cruz and singers Taylor Swift and Beyoncé. Oscar de la Renta, Evening Dress, resort 2013, silk, courtesy of Oscar de la Renta Archive (worn by Beyoncé Knowles in Vogue magazine, March 2013). 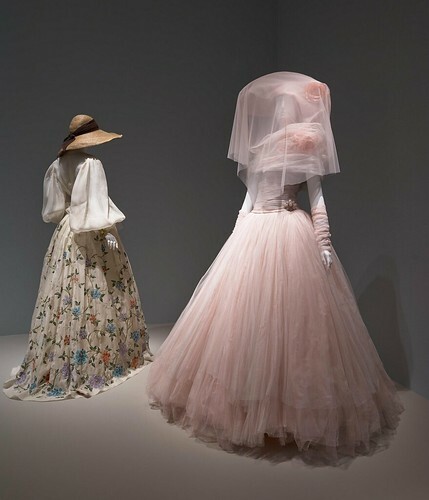 Installation view of The Glamour and Romance of Oscar de la Renta at the Museum of Fine Arts, Houston, October 8, 2017–January 28, 2018. Photo by Thomas R. DuBrock. Dubbed the “Sultan of Suave” for his uncanny ability to know what wealthy, sophisticated women wanted to wear, the late Oscar de la Renta’s creations live on in this extraordinary exhibition inspired by Houston client and socialite, Lynn Wyatt. The exhibition, which highlights a career in haute couture that spans some 50 years, features nearly 70 ensembles from legendary French designer, Pierre Balmain, MFAH holdings, and the fashion designer’s own archives. 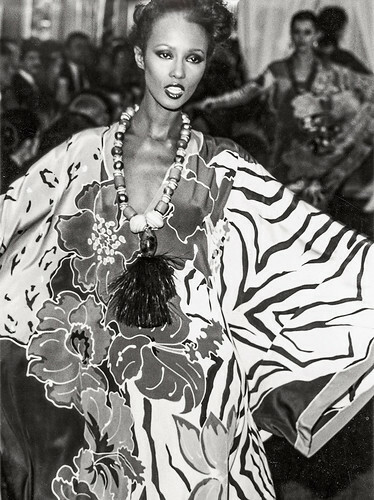 Curated by Andre Leon Talley, former Vogue editor-at-large, the exhibition also features fashion ensembles on public display for the first time. The exhibit includes a gown worn by former First Lady Laura Bush to the president’s inauguration in 2005. Among the phenomenal dresses on display is the wedding gown designed for and worn by Amal Clooney, wife of Hollywood actor George Clooney. Another outstanding wedding gown on display is that of Jenna Bush, daughter of former President George Bush and First Lady Laura Bush. 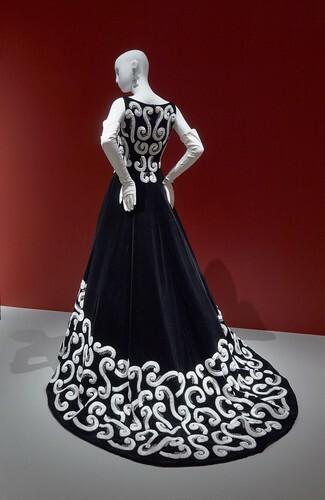 Oscar de la Renta for Pierre Balmain, Evening Dress, fall/winter 1999–2000, silk velvet, silk embroidery, and silk appliqué. 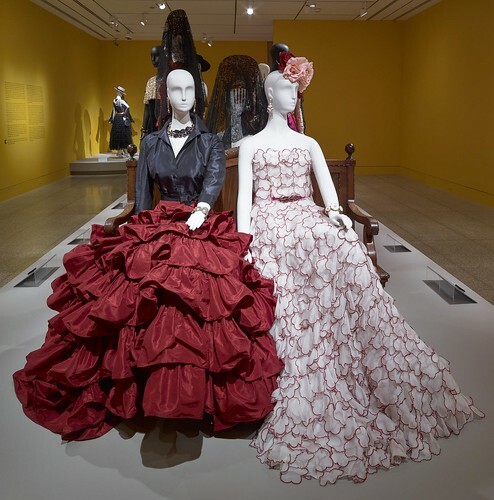 Installation view of The Glamour and Romance of Oscar de la Renta at the Museum of Fine Arts, Houston, October 8, 2017–January 28, 2018. 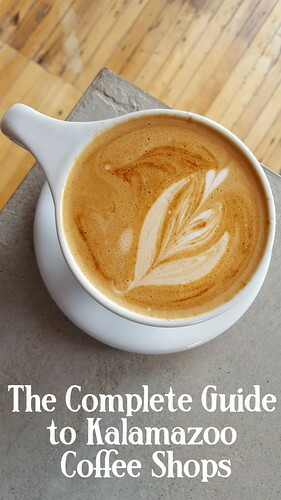 Photo by Thomas R. DuBrock. Upon entering the first gallery of the exhibition, visitors are thrust into Andalucia in southern Spain. There before them are mannequins donned in flowing red-ruffled and polka-dotted dresses. The Spanish-inspired couture conjures images of gypsy girls dancing flamenco. Some of the mannequins wear the traditional, classic Spanish mantilla. All exude the elegance and charm of a country that inspired the designer early in his career. Some mannequins are topped with traditional, classic Cordoba hats. 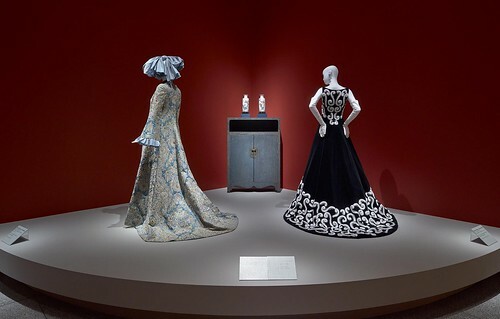 Installation view of The Glamour and Romance of Oscar de la Renta at the Museum of Fine Arts, Houston, October 8, 2017–January 28, 2018. Photo by Thomas R. DuBrock. De la Renta left his native Santo Domingo in the Dominican Republic in the 1950s and headed for Spain. There, the 18-year-old enrolled in the Royal Academy of San Fernando in Madrid, where he began to study painting and art. But he soon discovered he had a gift for fashion design instead. (L): Oscar de la Renta, Custom Evening Ensemble, 2001, silk taffeta and silk satin, courtesy of Oscar de la Renta Archive (worn by Mica Ertegun to an event celebrating her 40th wedding anniversary to Ahmet Ertegun, 2001). Installation view of The Glamour and Romance of Oscar de la Renta at the Museum of Fine Arts, Houston, October 8, 2017–January 28, 2018. Photo by Thomas R. DuBrock. (R): Oscar de la Renta, Evening Dress, spring 2013, silk organza and silk embroidery, courtesy of Oscar de la Renta Archive. 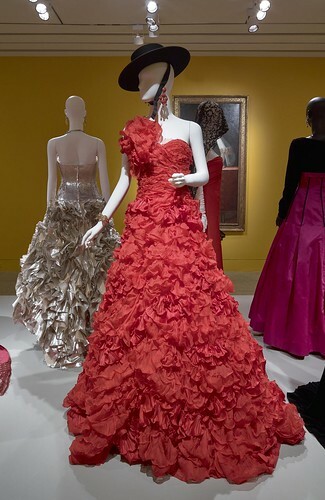 Installation view of The Glamour and Romance of Oscar de la Renta at the Museum of Fine Arts, Houston, October 8, 2017–January 28, 2018. Photo by Thomas R. DuBrock. That epiphany led him to secure a position in the fashion house of internationally acclaimed Spanish designer Cristobal Balenciaga. Christened “the master of all of us” by Christian Dior, Balenciaga had fashion houses in Spain prior to the Spanish Civil War of 1936. The war forced Balenciaga to close his establishments in Spain and move to Paris, where he founded the House of Balenciaga and continued designing for European royalty, including the queen of Spain and Belgium. Greta Garbo, Grace Kelly and Audrey Hepburn were among his celebrity clients. De la Renta arrived in Spain and later became an apprentice for the Balenciaga house. De la Renta remained in Spain until 1961 when he moved to Paris, where he secured a job with Lanvin-Castillo. There he rubbed shoulders with actress Catherine Deneuve and Elizabeth Taylor. A consummate fashion designer, he was also a great dancer and socializer. De la Renta moved from Paris to New York in 1963, accepting a position with Elizabeth Arden. In 1965 he started his own ready-to-wear designing company. His marriage to his first wife, Francoise de Langlade, editor-in-chief of French Vogue in 1967, helped make him the “go-to designer” of the wealthy and famous. Langlade died of cancer in 1989 and he remarried New York socialite and philanthropist Annette Engelhard Reed in 1989. De la Renta was named head designer of Pierre Balmain in 1993. By then, he had become an American citizen, thereby being the first American to ever lead a French fashion house. Balmain founded the fashion house in Paris in 1945. He too switched careers (architecture) before discovering his interest in high fashion. Balmain was known for haute couture marked by elegance and femininity. Balmain, like Balenciaga, also dressed Europe’s royals and Hollywood legends such as Vivien Leigh of “Gone with the Wind” fame and Mae West. (L): Oscar de la Renta for Pierre Balmain, Evening Ensemble, spring/summer 2000, silk organza, silk, metallic thread and bead embroidery, and silk applique. 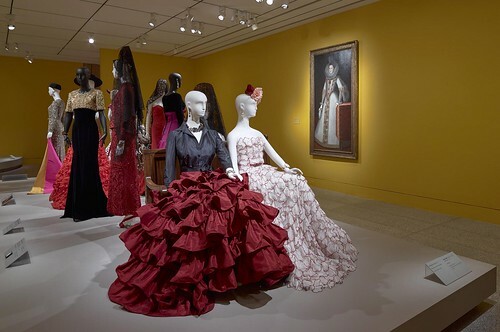 Installation view of The Glamour and Romance of Oscar de la Renta at the Museum of Fine Arts, Houston, October 8, 2017–January 28, 2018. Photo by Thomas R. DuBrock. (R): Oscar de la Renta for Pierre Balmain, Evening Ensemble, spring/summer 1997, silk and silk tulle. 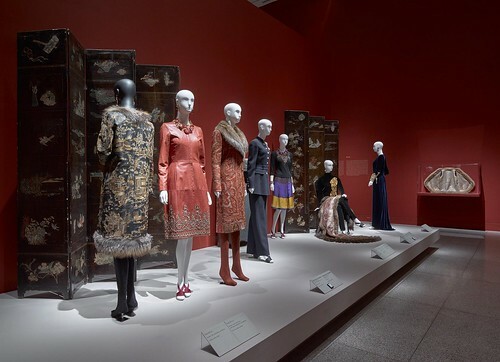 Installation view of The Glamour and Romance of Oscar de la Renta at the Museum of Fine Arts, Houston, October 8, 2017–January 28, 2018. Photo by Thomas R. DuBrock. The second and third galleries emphasize de la Renta’s later interest in Russia, China, and Japan. The Russia-inspired ensembles are particularly eye-catching for his use of fabric and delicate silk prints. A lover of nature, a garden setting is used as a backdrop for some of his most exquisite fashions. Fashion ensembles with distinct influences of China and Japan exude shimmering examples of modern femininity and quiet charm. De la Renta’s left an indelible mark on all he touched, including a line of perfume. De la Renta died in October 2014, leaving behind his wife Annette and an adopted son he found in an orphanage in the Dominican Republic. But his legacy of grace and elegance lives on not only in “The Glamour and Romance of Oscar de la Renta” exhibition, but in the annals of fashion history. Oscar de la Renta for Pierre Balmain, Evening Dress, fall/winter 1998–99, silk taffeta with bead, sequin, and metallic-thread embroidery, and chenille yarn, Texas Fashion Collection, University of North Texas, gift of Mercedes Bass. 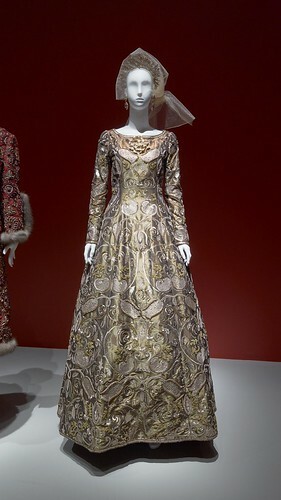 Installation view of The Glamour and Romance of Oscar de la Renta at the Museum of Fine Arts, Houston, October 8, 2017–January 28, 2018. Photo by Thomas R. DuBrock. The exhibition is housed in the Audrey Jones Beck Building at the Museum of Fine Arts, Houston, 5601 Main St. Tickets are $25 each for adults 19 years and older, $20 for seniors older than 65, college students, military and youth. Admission for all museum members and children under 12 are free. The MFAH is open at 10 am Monday through Friday. It opens at 12:15 on Sundays. For information on hours of operation, visit www.mfah.org/oscardelarenta.